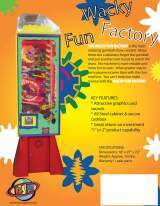 A Coin-op Vending Machine by DSM Sales & Manufacturing, Inc. Wacky Fun Factory © 200? DSM Sales & Manufacturing, Inc.